October 29th 1998. Nearly four decades after he became the first American to orbit the Earth, Senator John Hershel Glenn, Jr., is launched into space again as a payload specialist aboard the space shuttle Discovery. At 77 years of age, Glenn was the oldest human ever to travel in space. 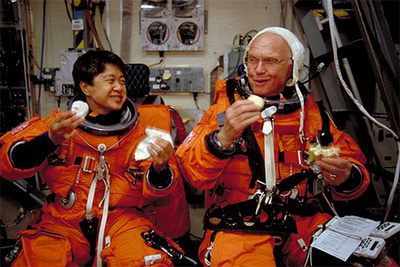 During the nine-day mission, he served as part of a NASA study on health problems associated with aging. Out of a reluctance to risk the life of an astronaut as popular as Glenn, NASA essentially grounded the “Clean Marine” in the years after his historic flight. Frustrated with this uncharacteristic lack of activity, Glenn turned to politics and in 1964 announced his candidacy for the U.S. Senate from his home state of Ohio and formally left NASA. Later that year, however, he withdrew his Senate bid after seriously injuring his inner ear in a fall from a horse. In 1970, following a stint as a Royal Crown Cola executive, he ran for the Senate again but lost the Democratic nomination to Howard Metzenbaum. Four years later, he defeated Metzenbaum, won the general election, and went on to win re-election three times. In 1984, he unsuccessfully sought the Democratic nomination for president.